This post was originally part of a fabulous Gift Card Giveaway to either Jo-Ann’s or Home Depot. The giveaway is now closed. As part of the giveaway, we were each given a $50 e-card to either Jo-Ann or Home Depot and asked to use it to create a DIY 4th of July project. Here is what I came up with! It’s so fun to celebrate the 4th with the family – and for us that means food!! :) We usually have a big cookout and watch the fireworks from my parents patio. Pretty sweet deal. So what goes perfect with a fun cookout? 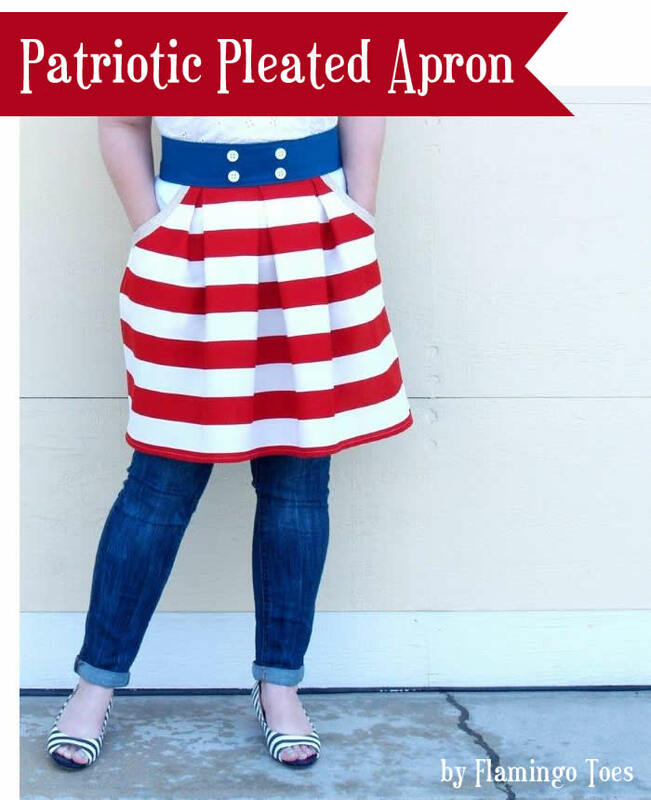 An adorable apron to wear while you’re cooking of course! 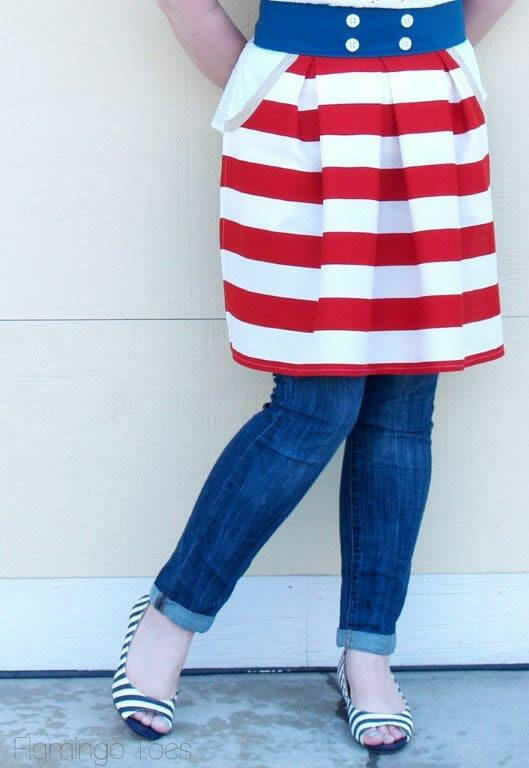 I found this wide red and white stripe in the home décor section of Jo-Ann’s – I love the weight of it! It’s a nice soft canvas and it was easy to sew up! I found a blue to coordinate for the waistband in the same section, to give it a patriotic/nautical feel. It has nice big pockets too! I love aprons with pockets – they are so comfortable plus I find that if I’m doing a marathon cooking section they’re great for tucking the end of a dishtowel into. The pattern for this cute little apron will be part of an Apron Pattern Set that will be available soon (next week!) I will update this post when the pattern is available for purchase. Now onto the extra fun part – The Giveaway! 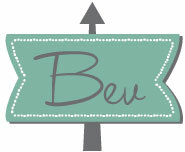 I teamed up with Coupons.com and 14 other creative DIY and craft bloggers for the giveaway. The giveaway is now closed but you can still check out all their fabulous projects below! Coupons.com offers a wide selection of digital coupons for both companies and brands. They are the largest provider of digital coupons on the web! Including coupons for Home Depot as well as Jo-Ann coupon codes. 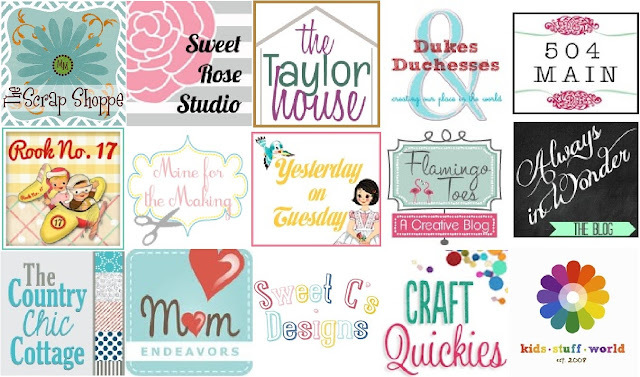 Make sure you check out all the other bloggers projects – they are amazing!! Very excited to make this apron! I would use the 40% off one item! For Home Depot, I’d use the 50% Red, White & Blue. And purchase some fabric to make your apron! At Home Depot, the 50% off red white & blue one! I’d use the Save 40% Off One Regular Priced Item code! I need a refrigerator, so I would use the Save up to $1,000 or more on appliances of $396+ at Home Depot! At Joann’s I would use the 40% coupon. At Home Depot I would use the 50% of Red, White, Blue coupon. Red, white and blue!!!!!!!!! I love the apron! I’m back! I got lost browsing the links. If I won the Joanne’s giveaway, I would of course buy fabric and copy your apron. It’s so cute!!! 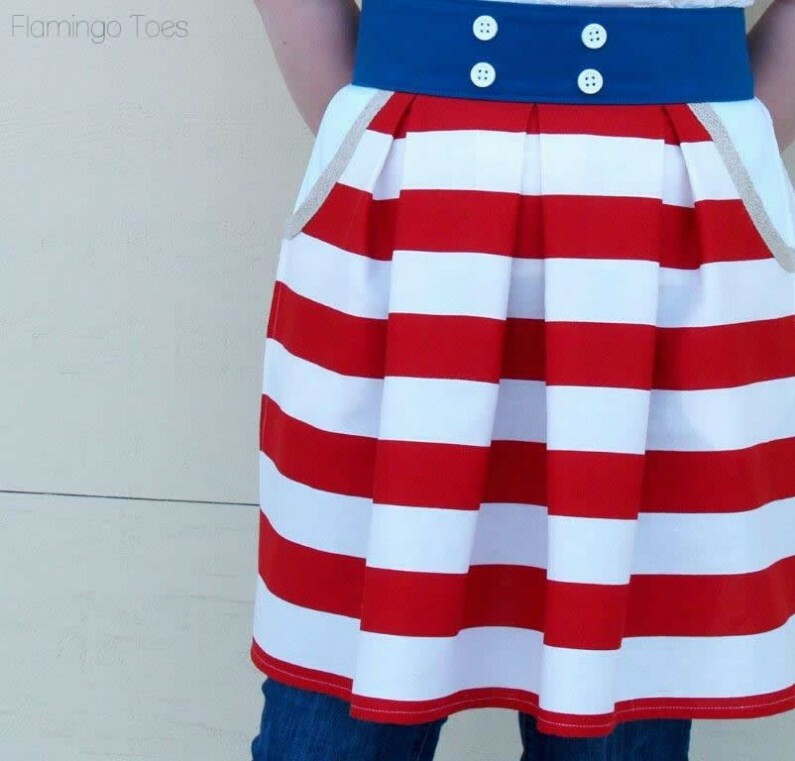 Imightmake mine a full skirt, since I don’t actually cook. And I’d make several, since that would buy a lot of fabric:) at Home Depot, I would buys bunch of trellis for the garden,and try to get my strawberries to climb. I want homemade jam all year! I’d use 40% off scrapbooking and make a 4th of July Scrapbook page! I’d use 50% off Red White & Blue to set up a 4th of July cookout! I would TOTALLY use the 40% off at JoAnn’s coupon to buy some fabric to make that awesome apron you posted the tutorial for!!! I always have a hard time figuring out which is the better deal if I have multiple items: 40% off one item or 10% off my total order. Either way, I am hankering to make some cloth napkins, and holiday ones would be awesome! I LOVE the apron, btw! At the Home Depot, I would love to use 15% off a Dyson vacuum! i would likely use the 50% Off Select Items with the Red White & Blue Sale & buy a replacement grill for my dad’s poor one in need of a major upgrade!! At Home Depot I would use the 30% off select Kenroy home lighting to get a new hanging light for above our kitchen table. I would use the 50% off Red, White & Blue sale at Home Depot coupon. I’d love to make a serving tray of some kind. Of course, my hubby would have to help me on that, but he’s quite handy. Save 40% Off One Regular Priced Item – I would use it to buy home dec fabric very similar to yours to make this adorable apron. The Home Depot 30% off coupon I would use to make Patriotic decorations for the front, back and inside of our home. I would use the 10% off my total purchase. I would use the 10% off order coupon to buy material to make napkins and placemats for my patio furniture! I would use the 15% off small appliances as my toaster broke! I would use the 40% off a regular item. I’m always in JoAnn’s buying something! I would also use the 15% off small appliances because my electric can opener is acting up. I would use Joanns 40% off coupon. I would use Home depots 15% off small appliances as my toaster recently quit working. AE831 40% off at JoAnn’s is a great deal! SAVE15 I would use the 15% off at Home Depot on small appliances. I need a new toaster oven. I would use the 40% off one item to get some fun fabric for a 4th of July decor. I would use the 15% off small appliances to get a new coffee maker! I would use the 40% off one regularly priced item at JoAnn’s to buy a big cut of solid fabric to mix in with prints in my stash and make a 4th of July picnic blanket! At Home Depot I would use the Save 20% Off Dyson Vacuums coupon and try to get my house in order for holiday guests!!! I would use 40% off (AE831) for fabric to add to my stash. SAVE15 – Deep fryer to help make July 4 meal (and lots of other days) better. I would use the 40% off one item (AE831) and probably get a nice big cutting mat. I’m so excited that JoAnn Fabrics is opening up a super store in our neighborhood. I’m going to use the coupon code AE831 and find something fun to create. I always love the 40% off one item codes!!! Probably the 15% off small appliances at Home Depot! I would use the 40% off one item and get some backing fabric for a quilt. Thanks! At Home depot I would use the Save up to 30% on all overstock items coupon. Who doesn’t want to save 30%!! Thanks! I’d use the code DYSONHD20 to help purchase a Dyson Vacuum to get ready for my July 4th company. If I don’t have to use a code, I think the $199.00 DEWALT 20-Volt Max Li-Ion Cordless Combo Kit (2-Tool) is a great buy for my man to create some pallet benches for the 4th of July company to sit on outside! I would use the 10% off your order code so I could buy all the accessories to make a cute 4th of July burlap wreath! I’d use the free shipping Home Depot code in order to get items to make my aforementioned wreath AND so I could paint an Adirondack chair red, white, & blue! I would use the 10% off of your order code so that I could buy various fabrics to make flag pillows! I would use AE831 (the 40% off one regular priced item) for a new sewing machine! Mine was a cheapy and it’s worn out. I would like to use the savings offered on paint so that I could paint the new chairs I’d like to make for the deck . Then I could put my new flag pillows on them! Code AE831 for 40% off a piece of fabric for making a patriotic table runner. I could use it year round because I love Americana. The savings on paint to spiffy up our deck. I would use the 40% off coupon and get enough fabric to make an amazing Canada Day picnic blanket! I’ve been crushing on the lovely roll up ones I’ve been seeing all over the place! I’m not sure this counts – but I would use a coupon to buy us some twine for crafting with and gardening with. I would use the home depot gift card toward fixing the leak in my roof and a few hardware finds to do some crafting. Your apron is so cute at first I thought “What an adorable skirt but why is she wearing jeans underneath”. Love it. I’d use the $5 off 1 gal paint coupon from Home Depot. The next step in our living room renovation is to paint. At Joann I’d use the 10% off coupon. I have been thinking about making some cute hair bows for my girls. I would love a JoAnn’s gift card. I have some organizing in my craft area so I can get more creatvive!! I would use the “Save on sale and promotional items”.I would use a it to buy kids activity and summer camp kits which is 60%off. I would make 4th of July themed crafts with my kids. Bev you outdid yourself with this one. What a phenomenal project. 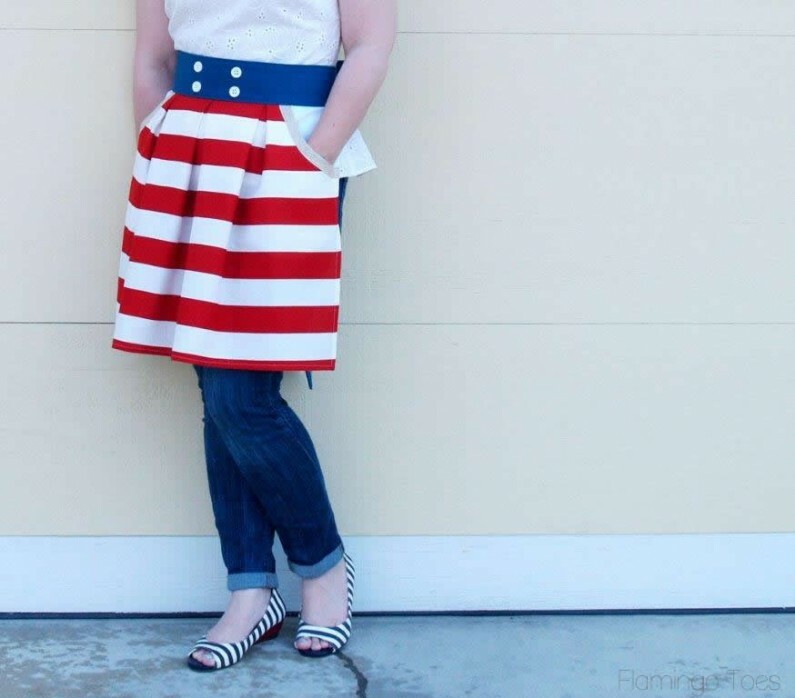 You will be looking perfect on the 4th of July! I would use code AE831 for 40% off one regular priced item, and then I’d shop for a huge canvas or folding posterboard I can use for a design wall. At Home Depot I’d use the coupon for $5.00 off 1 gallon paint cans, so I could decorate flower pots in patriotic colors. I would use the “Tool Combo kits- Your choice only $199” to buy Kreg tools to make wooden crate with casters. I have been eyeing Kreg tools for a long time now and would love to start doing small DIY projects. I could have used the SAVE15 coupon yesterday to make my after-4th birthday treats with a KitchenAid mixer or food processor. I make a ton of pasta salads in the summer. It’s a great way to use up garden produce. So, I would use the SAVE15 coupon code for small appliances and buy the kitchen aid pasta attachments. Hello homemade goodness! I would use the 10% off total purchase at Joann’s to get a Dritz dress form. It’s hard to make alterations to something when you’re both wearing it and doing the alterations. A dress form would be super handy for all those summer dresses. 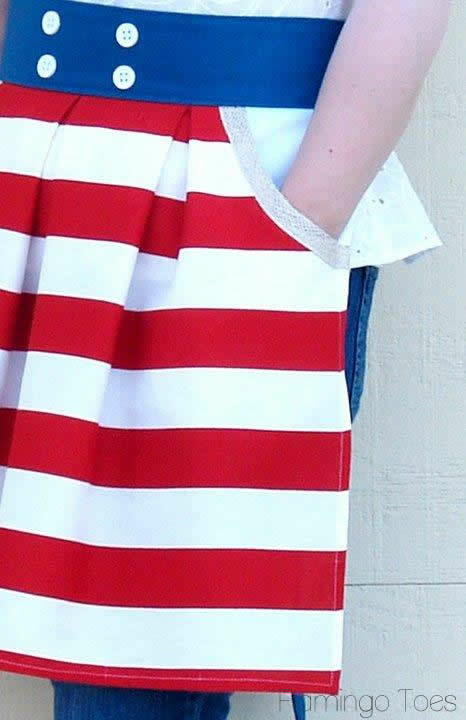 I would use code AE831 at Joanns.com for my 4th of July craft! I would use code SAVE15 at HomeDepot.com to save a chunk on a Dremel. I sooooo want a Dremel. I would use the 40% off code (AE831) to stock up on fabric. For next year since I am already late for this 4th of July! Save15 and get a new dishwasher. Not much of a 4th of July project, but we need one! I would use the Save 10% Off Order at Joann. . .Even though 4th of July has passed, I still need a summer wreath, so I would be buying items to decorate for general summer. At HOme Depot, I would use the Save $5 Off 1-Gal Paint Cans & $20 Off 5-Gal Buckets code. 4th of July is over, so I wouldn’t be making a patriotic project, but I need to spruce up the outside for summer. Bright, summer colors would make such a difference outside! I’d use the “SAVE!15” code to buy a new Kitchen Aid stand mixer for my kitchen. MIne’s been broken for almost two years and I HATE not having one! I love your Patriotic Goodies you shared. I think if I could probably put a huge dent in a Jo Ann’s Card!! Even a Home Depot one also!! The 40% off a regular price item. Thanks for the giveaway!! I’d use AE831 to get 40% off on fabric! I’d use SAVE15 at Home depot so that I could get a new coffee pot to have the oomph to do a project! I would use the AE831 code for 40% off a regular priced item! I would use the SAVE15 code to save 15% at Home Depot! I would use the save15 at home depot toward a number of things we need in our new home… anything from a mini vacuum to tools for hubby! I could so use this at Jo-Anns! I’d use RFKH187 and buy an entire roll of Pellon (on sale for 50% off right now). I’d use SAVE15 and buy an over the range microwave! LOVE LOVE LOVE IT! THanks for sharing! I would use the save15 at Home Depot on a large spool of rope to use for a nautical theme in my craft space. I’d use the 40% Off One Regular Priced Item Joann’s coupon for red white and blue oilcloth for a large tablecloth.